Another week of a dearth of news and the market finds significant comfort in the void. The Kansas City Federal Reserve's meeting in Jackson Hole did nothing to stoke the market's advances, failing to add to weekly gains that were the best in the 4 months. Decreasing volatility increases complacency and the market has shown an ability to shut out the winds that might raise concerns and nerves. 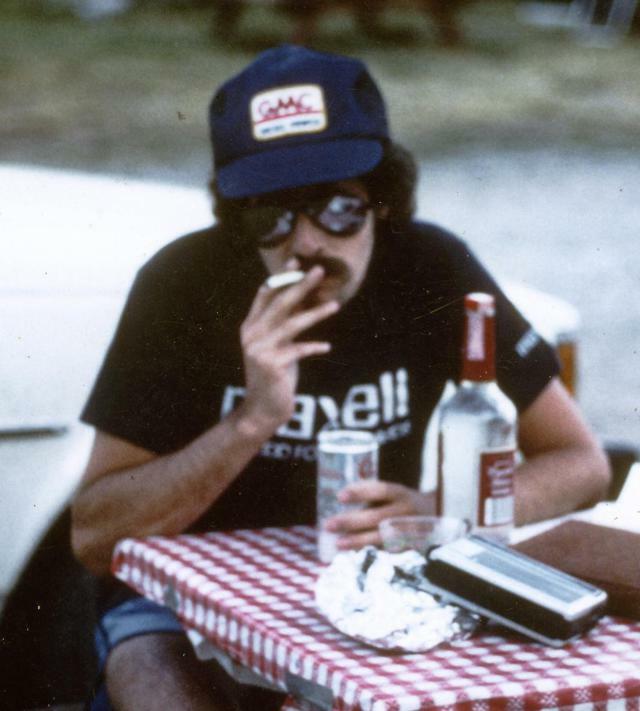 For two consecutive summers back in 1981 and 1982, I found myself in Jackson Hole. Although both times were in August, I don't recall having run across any Federal Reserve types at the time. However, if they were there, they certainly weren't staying in the same campground, but I'm guessing that their table was set much the same as mine, when big decisions in an era of 15% Fed Funds rates and the burgeoning money supply were being made. And not the type that are rolled, as good old fashioned Jackson Hole cowboys were reported to do. Too much exchanging of those rolled papers could definitely lead you into some kind of complacency. I know that I really didn't care too much about what was going to happen next and was content to just let it all keep happening without my input. This past week was one when neither decisions nor inputs were really required from investors as the market had its best week in about four months. With the exception of a totally inconsequential FOMC statement release, there was absolutely no economic news, or really no news of any kind at all. 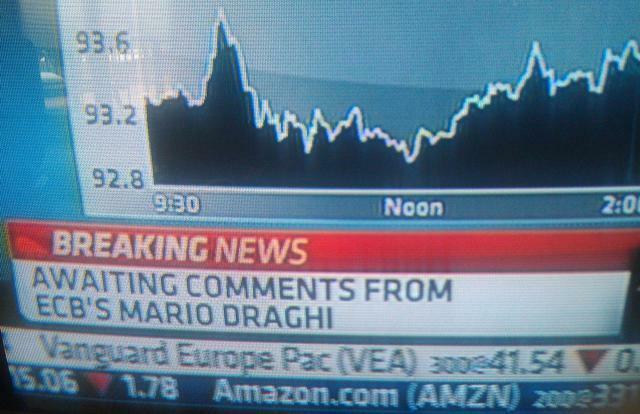 In fact, awaiting the scheduled remarks from Mario Draghi was elevated to the status of "breaking news" as most people were tiring of seeing celebrities getting doused with a bucket of ice, under the guise of being news. Instead, all eyes were focused on the Kansas City Federal Reserve's annual soiree in Jackson Hole, awaiting the keynote speech by Janet Yellen and then some words from her European counterpart, Mario Draghi. For her part, Janet Yellen's prepared remarks had no impact on markets, which were largely unchanged for the day. The speculation that the real market propelling catalyst would come from Draghi, who was said to be ready to announce a large round of European quantitative easing turned out to be unfounded and so the week ended on a whimper, with many traders exercising their complacency by having embarked on an early start to the last of summer's weekends. While not going out in a blaze of glory, markets again thrived on the lack of any news. In that kind of environment you can easily get used to the good times. With many believing that the Federal Reserve's policies were responsible for those good times and having a "dove" at its helm, even with telegraphed interest rate hikes and an end to quantitative easing, auto-pilot seems so right. As usual, the week's potential stock selections are classified as being in Traditional, Double Dip Dividend, Momentum or "PEE" categories. This week, I'm drawn to summer under-performers and there appear to be quite a few among companies that can have a place even in very traditional portfolios. Deere (NYSE:DE) announced further layoffs this past week and has been mired at $85 level. Despite record crop yields, Deere has gone fallow of late. While I may still like to see it trading a little lower, it is definitely in the range that I like to own shares, not having done so since August 2013, despite it being a portfolio mainstay, at one point. While its premiums are somewhat depressed along with most everything else, at the moment stocks that have under-performed the S&P 500 for the summer have some enhanced appeal at the market's current dizzying heights. Although the question "how much further could it possibly fall?" is not one whose answer most people would want to hear, I like considering high quality companies that have under-performed, as the market adds to its own risk for reversal. Also in the heavy metal business, General Motors (NYSE:GM) has been subject to more scrutiny than most companies could ever withstand and I think its CEO, Mary Barra, has reacted and performed admirably, trying to get ahead of the news. In that process, General Motors has also found itself mired, but trading in a fairly predictable range, having a nice option premium and an upcoming dividend offer reasons for consideration. However, in order to capture the dividend I may consider the use of a monthly contract, although expanded weekly options are available. With a Monday ex-dividend date, one can even consider the sale of a September 12, 2014 contract and trade off an extra week of option premium for the dividend, if assigned early. International Paper (NYSE:IP) may not be the stuff of heavy metal, but there is a chance that some of those white papers controlling our economic and banking policies were presented on their products. It's also possible that some of those erstwhile cowboys passed an International Paper product along to their friends around the campfire, years ago. At its current trading level, International Paper has my attention, although I do already own some more expensive and uncovered shares. Management has sequentially created value for investors through strategic spin-offs, which may continue and a healthy dividend. It, too, has under-performed the S&P 500 of late and should have limited geo-political risk, although it does have manufacturing facilities in Russia and "International" in its name. It's not too often that I think about adding shares of a Dow component or a really staid "blue chip." However, despite some low option premiums that usually accompany such names, this week it just feels right, perhaps as somewhat of an antidote to geo-political risk. Both McDonald's (NYSE:MCD) and Kellogg (NYSE:K) also happen to be ex-dividend this week and are generous in their distributions. Both have also taken their lumps recently, badly trailing the already mediocre S&P 500 through the first two months of summer. While McDonald's isn't entirely immune to geo-political risks, witness the sudden closure of its flagship Russian restaurant and others throughout the country, following the pattern initially seen in Crimea months ago, the risk seems to be limited, as the real issues are with declining American tastes for its products. Kellogg quietly manufactures its products in 18 countries and markets them nearly everywhere in the world, yet it's not too likely that anyone or any government will make Kellogg the scapegoat for its geo-political shenanigans. Although I've never purchased shares, it's a company that I consistently look at in order to capture its dividend, but have always gone elsewhere to be requited. Halliburton (NYSE:HAL) also goes ex-dividend this week, but its puny dividend isn't the sort of thing that beckons anyone to begin a chase. However, shares have recently been under attack. 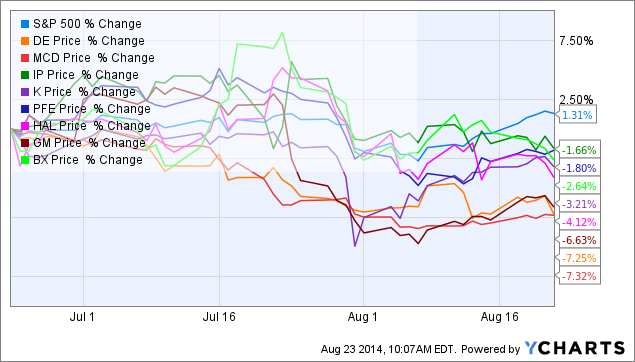 Although only mildly trailing the S&P 500 for the summer, its decline in the past month has been 8%. That's enough to get my attention in return for receiving an option premium and perhaps a dividend payment, as well. Pfizer (NYSE:PFE) is somewhat of a mystery to me. It is thought to have a relatively shallow pipeline of new drugs, has been rebuffed in its attempt to swallow up some competition and perhaps gain a tax inversion opportunity. The mystery, though, is why shares had fallen as they have done over the summer. Whatever disappointment existed due to the failed buyout was in excess of any premium that the market attached to that buyout and the favorable tax situation. As with International Paper, I already own uncovered shares, but am willing to now add shares as it has shown the ability to bounce back from its recent lows. While its premium isn't necessarily the most provocative, in the past it has been the ability to repeatedly rollover shares that has been the real reward. You can add Blackstone (NYSE:BX) to the list of uncovered positions that I hold, with the most recent contract expiring this past Friday. Undoubtedly, Blackstone's prospects are tied to a healthy stock market and an overall healthy economy, as its varied business interests and investments are the real product and they live and die through the whims of both masters. That's the kind of risk that's represented in its high beta and reflected in its option premiums. However, in this period of extraordinarily low volatility, even Blackstone is having a hard time generating premiums of old. Still, its recent decline, in the absence of any real news and during a market rise makes me believe that despite the warning signs, it may offer some safety, particularly if there is further strength in the financial sector, as in the past week. I had been hoping to have my shares of Best Buy (NYSE:BBY) assigned this past week, in order to have a free and clear mind when considering the upcoming earnings report this week. That wish was granted and it's again time to consider a trade in shares. Best Buy frequently offers a good earnings-related trade due to its enhanced premiums, that in turn are due to its propensity for explosive earnings-related moves. While the option market is currently assigning an implied move of 8% next week, an ROI of 1% can currently be achieved by selling puts at a strike level 8.7% below Friday's closing price. I generally like to see a larger gap between the implied volatility and the strike price returning the threshold premium before considering the sale of puts in advance of earnings. In this case, I may be more inclined to wait after earnings and willing to pile on if shares disappoint. However, with an ex-dividend date just two weeks later, rather than selling puts in the aftermath of a large share drop, I might consider the purchase of shares and sale of call options. Finally, what a roller coaster Abercrombie and Fitch (NYSE:ANF) has found itself riding. After garnering the honor being named the "Worst CEO of 2013" shares have made an impressive turnaround. I have no clue how suddenly its products could have become "cool" again, or why teens may now be flocking to its stores or what aggressive strategic changes CEO Jeffries may have implemented, but the sudden favor it has found among investors is undeniable, as shares have left the S&P 500 behind in the dust over the past month. For me, that kind of share acceleration is a perfect message to consider the sale of puts as earnings are to be released. The option market is implying a price move of 8.6%, however, a 1% ROI may be achieved at a strike level 13.8% below Friday's close. That's the kind of gap that I like seeing. However, as with Best Buy, there is the matter of an ex-dividend date, which happens to be on the same date as earnings are released. If wanting to take part in this trade, that essentially leaves three different scenarios, including the commonly executed sale of puts before or after earnings. In the case of doing so before earnings, the sale of puts in the face of an impending ex-dividend date frequently works to the disadvantage of the seller, much in the same way as selling calls into an ex-dividend date serves as a seller's advantage. That disadvantage is eliminated in selling puts after earnings, in the event of the share's decline. However, another possibility, and one that would very likely include retention of the dividend, is the sale of deep in the money calls, particularly if using a monthly expiration. Additionally, if shares move higher after earnings, once the added volatility is removed, the deeper in the money position may likely be closed at a small net price following concurrent share sales, allowing funds to be re-deployed. Disclosure: The author is long BX, GM, IP, PFE. The author wrote this article themselves, and it expresses their own opinions. The author is not receiving compensation for it (other than from Seeking Alpha). The author has no business relationship with any company whose stock is mentioned in this article.